It’s almost Hanukkah, a time to light the candles, spin the dreidel, and argue about how to spell the name of the holiday. The “Channucah” menu in Bellin’s Jewish Cook Book, 1941. Pineapple and banana cocktail recipe in Bellin’s Jewish Cook Book, 1941. Julienne soup recipe in Bellin’s Jewish Cook Book, 1941. Goose liver with mushroom sauce recipe in Bellin’s Jewish Cook Book, 1941. 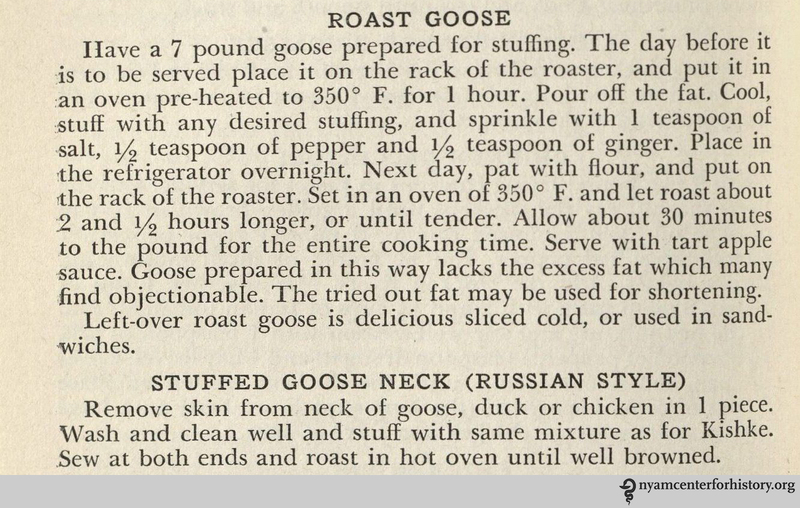 Roast goose recipe in Bellin’s Jewish Cook Book, 1941. Potato pancakes recipe in Bellin’s Jewish Cook Book, 1941. 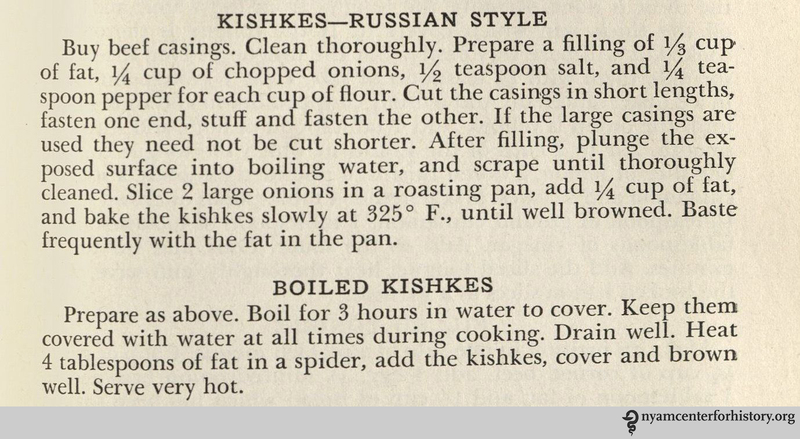 Kishke recipes in Bellin’s Jewish Cook Book, 1941. Pickled beet recipe in Bellin’s Jewish Cook Book, 1941. Cauliflower recipe in Bellin’s Jewish Cook Book, 1941. Recipe for rolls in Bellin’s Jewish Cook Book, 1941. Apple sauce recipe in Bellin’s Jewish Cook Book, 1941. 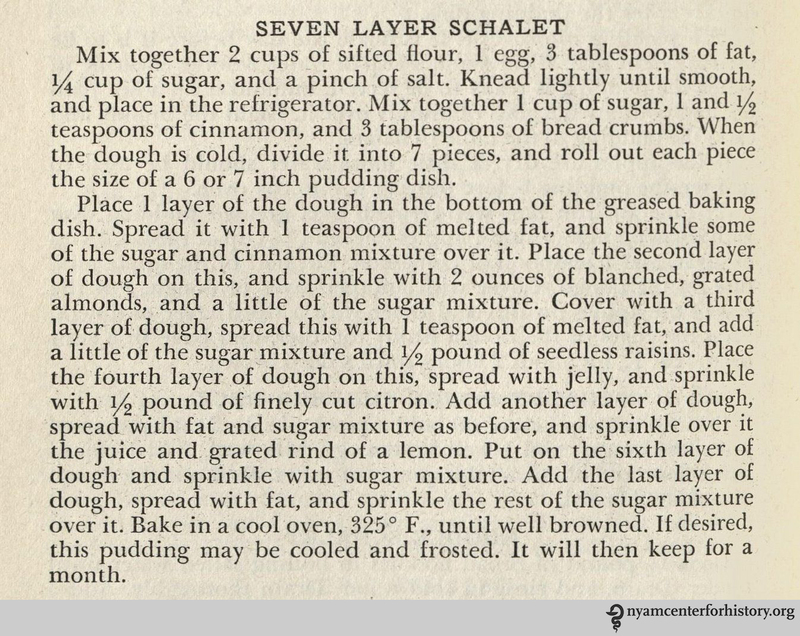 Seven layer schalet recipe in Bellin’s Jewish Cook Book, 1941. “Hanucah Cakes” in Henry’s Economical Jewish Cook, 1897. And what would the holiday be without doughnuts? Here are a selection of recipes, one from the Brooklyn Jewish Women’s Relief Association’s A Book for a Cook (1909) and the rest from The International Jewish Cook Book (New York, 1918). 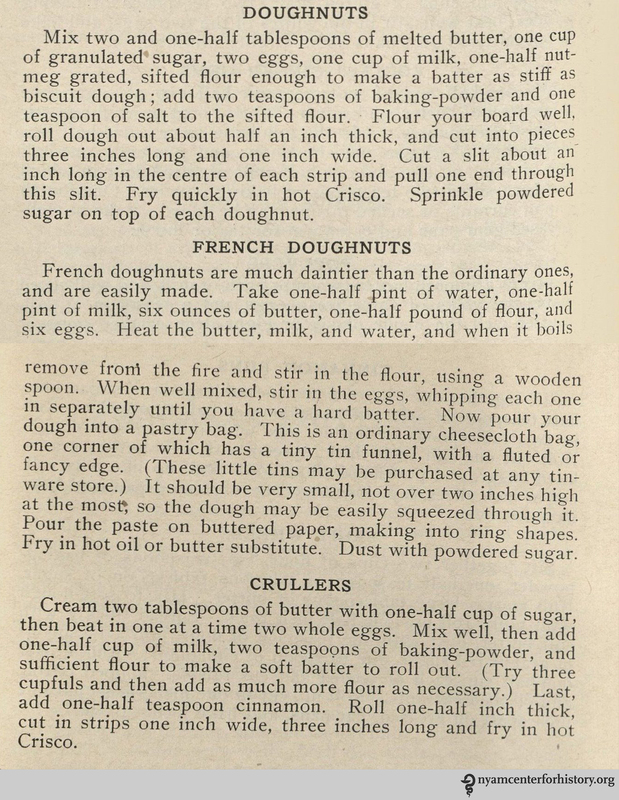 Recipe for doughnuts in the Jewish Women’s Association’s A Book for a Cook, 1909. Several doughnut options from Greenbaum’s The International Jewish Cook Book, 1918. If you try making any of these recipes, please let us know and share a picture of the results. 1. Yes, we know the holiday commemorates a military victory, too. This entry was posted in Collections and tagged Eating Through Time, food, Food 2015, Hanukkah, holidays, jewish cooking by nyamhistorymed. Bookmark the permalink.